All of our building packages are guaranteed to meet or exceed all Local codes. 10% pitch roof metal or architecturial, stair well and living space above. Welcome, we have a family owned three generation business, all management by family owners or employees. We can provide custom roof designs to blend with your existing home. Our one and two car garages are designed to accent most homes. price wrapped around the budget that you have in mind. 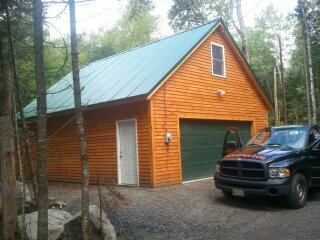 The Above Garage, built in Scarborough Me the Best thing you can do for the equity of your home!